RCE Greater Western Sydney (RCE-GWS) and Western Sydney University’s Learning Transformations (opens in new window) hosted the 11th Asia-Pacific RCE Regional Meeting (A-P RCE Meeting) in Parramatta on 25 September 2018. 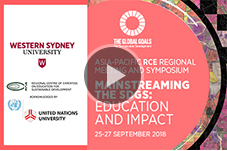 This was held in conjunction with the Symposium ‘Mainstreaming the SDGs: Impact and Education’ on 26 September and commenced with the first Asia-Pacific Youth Virtual Summit held on 24 September 'Youth for the Goals: Climate Action and Life Below Water' as part of the first Youth SDG Challenge 2018. Field trip visits followed on 27 September to Sydney Olympic Park (Smart and Green Cities) and the Hawkesbury Institute for the Environment EucFACE Experiment and Brewongle Environment Education Centre (Climate Change and Culture). This event is an initiative of the University's 21st Century Curriculum Renewal Project (opens in new window), which supports our cross disciplinary flagship sustainability work. An RCE is a network of existing formal, non-formal and informal education organisations, mobilised to deliver Education for Sustainable Development (ESD) outcomes to local and regional communities. 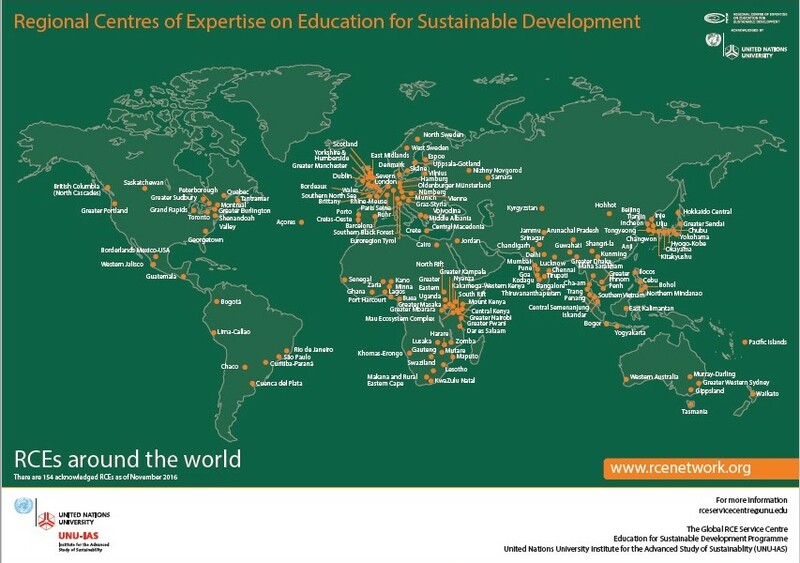 To date over 150 RCE's have been endorsed globally and constitute a Global Learning Space for Sustainable Development. View all RCEs around the world (opens in a new window). The global RCE network is coordinated and delivered through the United Nations University and aspired to achieve the goals of the UN Decade of Education for Sustainable Development (DESD, 2005 - 2014). The Global Action Programme (GAP) (opens in a new window) on Education for Sustainable Development (ESD) is the follow-up to the DESD which seeks to generate and scale up concrete actions in ESD. The focus is now to contribute to the 2030 Sustainable Development Agenda and the Sustainable Development Goals (SDGs) (opens in a new window). The network is divided into regions: African and Middle East, Asia-Pacific, Europe and The Americas. Find out more by visiting the UNU Regional Centre of Expertise on Education for Sustainable Development (opens in a new window) website. "International Perspectives for Sustainable Development" study program supported by the Office of International at Western Sydney connected 10 Western Sydney University students with local government officials, schools and farmers in the Philippines. Students enrolled in the Bachelor of Tourism Management, along with Bachelor of Natural Science (Environmental Management) and Bachelor of Sustainable Agriculture and Food Security undertook a week long intensive study tour in April 2017. Based in the Bohol, the students learnt about sustainable development, land-use, eco-tourism and embraced the local cultures and cuisine. 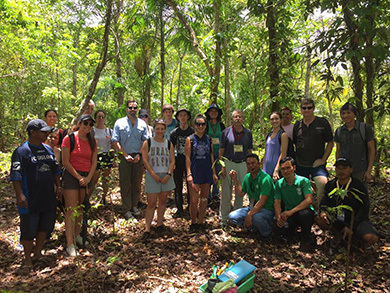 Students experienced first hand and research the impacts and challenges of local urban planning in the contexts of climate change developing ecological agriculture and conservation/agri- tourism in a largely subsistence Asian farming economy. "It's pretty clear that the poverty and development challenges have had a profound impact on the students – they are talking about the culture shock and they seem to be making links quite early with the assignment – especially given there is plans for an international airport for this tiny, picturesque island. ", Jen Dollin, Manager Office of Sustainability. Connected via United Nations Regional Centre of Expertise on Education for Sustainable Development network, Bohol Island State University and Rotary Club, the students connected with students from two local schools during their stay, donating money and gifts for their nutrition program. They participated in cultural tours, lectures, site visits, hands-on activities including a Mayoral Welcome Dinner and a Regional Policy Planning workshop attended by local government members. "It was so interesting experiencing the contrast between Australia, Manila and Bohol! Through our clean cities, Manila's traffic and Bohol's nature, every city is different. It just goes to show how truly diverse and unique culture and heritage is. During the mayor visit, she was telling us how everyone is telling her that they need to focus their tourism marketing towards eco-tourism, however, they need to have sustainable environmental planning in order to make that happen. A lot of work needs to be done in order to get Bohol to the stage the mayor wishes it to be at, and hopefully we can help. ", one student reflected. We are hopeful that other student groups will undertake a similar trip in 2018. 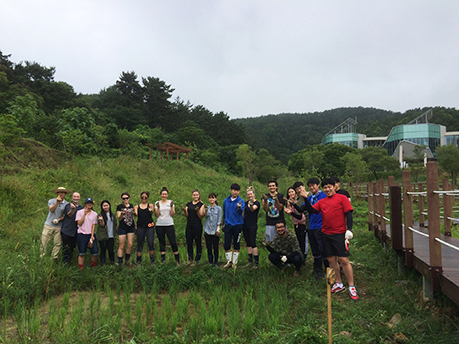 "The Business of Sustainable Tourism" program funded by the Australian Commonwealth's New Colombo Plan Mobility Project connected eight Western Sydney University students with local tourism networks in South Korea. Students enrolled in the Bachelor of Tourism Management undertaking the Destination Management Unit, along with two University staff, undertook a two-week transformative study tour in July 2016. Based in the Tongyeong Sejahtera Centre and the city of Busan the students learnt about sustainable and cultural tourism and embraced the local cultures and cuisine. Supported by the United Nations Regional Centre of Expertise on Education for Sustainable Development network the students connected with students from Yonsei University and Gyeongsang National University during their stay. They participated in cultural tours, lectures, hands-on activities including a joint session on Sustainable Development Goals 2030 and a Regional Tourism and Policy Planning workshop attended by forty local tourist operators, organisations and local government members. "Indeed, we truly enjoyed the visit and it created a unique chance for the young people of three universities to connect with each other under the common goal of sustainable development", said Won J Byun, Sejahtera Forest Centre Chief Programmer. "Personally, I enjoyed the insightful comments students made regarding what may be improved in terms of sustainable tourism in Tongyeong, which was also shared via local newspaper", she continues. At the forum students were asked to comment on their experience in Tongyeong after a scheduled city familiarisation day whereby they visited the local food and fish markets, old Buddhist temples and the modern cable car. They addressed the positives and negatives of their experience as tourists and young professionals and presented their ideas to the attendees. Kim Dong-Jin, Tongyeong Mayor said "Tongyeong is a city with many opportunities in areas such as work culture, history and the ocean. Today through the international exchange of 3 universities, I hope Tongyeong can move towards an edu-tourist city." "We attended the Tourism Sustainability Forum this afternoon where we listened to guest speakers (including our own Dr. Ian Knowd) and collaborated with our groups in order to come up with ideas for improving tourism within Tongyeong. The atmosphere within the room was amazing; we wore headsets for interpretation as the speeches were spoken in Korean. To have the opportunity to sit in on a forum like this which is spoken in a foreign language is a privilege. It gave a real sense of the passion and efforts that are put into the program. The body language, facial expressions and tone really emphasised the importance of sustainable tourism within the Tongyeong area. ", Western Sydney student, Jessica McNevin, reflected.